I am so pleased to be selected again for the RWS Contemporary Watercolour Competition, for innovative work in water-based media. I took Haiku 02 up to Bankside Gallery on Monday ready for the private view this Thursday, and am hoping the beast-from-the-east snow forecast is wrong. I've long felt that some of my small-scale paintings are haiku-like, but it’s nothing to do with physical structure. Haiku is a tiny Japanese poem-form, usually seventeen syllables in three lines. I don't base a haiku painting on a particular poem, or write one to go with a painting. When I'm painting, there are no words. So how can a painting be haiku (the word is both singular and plural) when there are no words? What is a painting like this about? It's about what's happening when there are no words. About noticing a particular moment, perhaps easily missed, in the maker’s experience that comes before the words. Haiku poems are about a moment or cut in time. Not much happens - there is no narrative arc, just a perception of something or being struck by a realisation. Arguably, the subject of haiku is simply the act of noticing. This launches the project of putting the experience into language. The haiku paintings begin with incremental marks made at different times, often when I am teaching and need to paint something to show what I mean. Despite a degree of abstraction, the original marks are made from observation - they're not invented. But then, away from teaching, further provisional forms are added, removed, extended or reduced with paint and with tearing, cutting and collage. It’s more like kneading something into shape without knowing what the final outcome might be, than copying an existing vision of what the painting should look like. They are about the experience of seeing, not about verifiable likeness. And they are especially about the moment of seeing, easily missed, when provisional ingredients, tensioned by the cutting and tearing, coalesce into something whole. This is their haiku moment. It's a bit like watching a slow-loading pixelated image come into focus, arranging furniture so that a room comes alive, putting something at the back of your mind into words. At a sub-verbal level, it's as if the painting answers an inner question or corresponds to some inner pattern or structure, as an unplanned form comes into sight. But instead of launching the project, it is the moment to apply the brakes, as the painting resolves. The haiku paintings are about sensing a moment of resolution: an inner signal that going on will change the painting but not improve it. And about stopping in time. 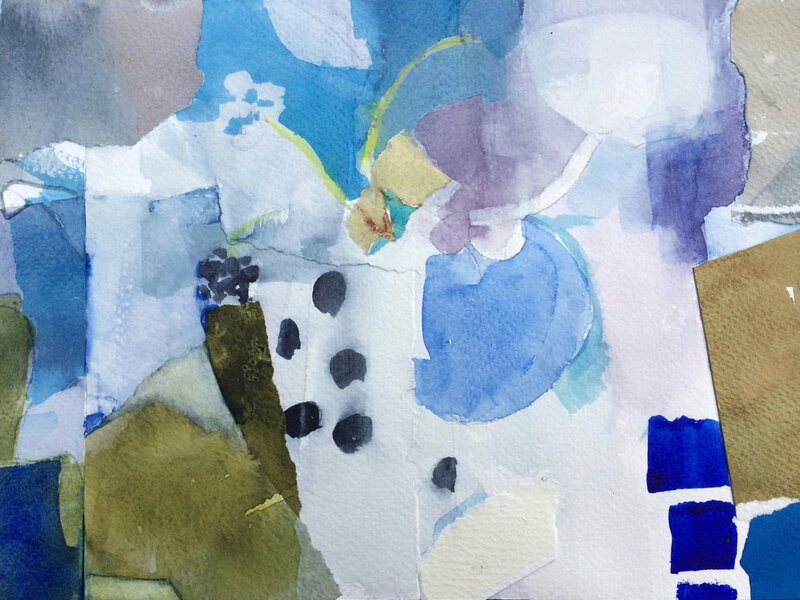 Haiku 02 will be shown In the RWS Contemporary Watercolour Competition 2018, 2-14 March 2018, Bankside Gallery, Thames Riverside/48 Hopton Street, London SE1 9JH.